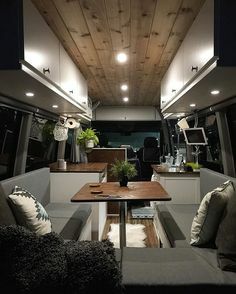 One special specific type of Tiny House is the Sprinter Van Conversion, though the idea applies more widely to van conversions, RV conversions, and 'skoolies' or school bus conversions. 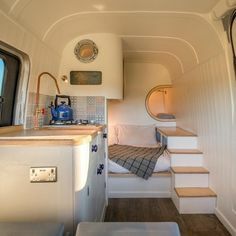 We have received many inquiries from people converting their RVs, School Buses (Skoolies), and Vans (especially Sprinter Vans), into Tiny Homes. Most of these inquiries are regarding natural insulation, though our natural flooring and natural finishes are also a 'natural' fit. Perhaps our next most popular product for these conversions is our selection of Forbo Marmoleum natural flooring. Marmoleum is not limited to floors though! The owner of Eco-Building Products did the counters, walls and ceiling of his food truck too! Regarding the road vibrations, you will want a way to address the possible settling of any insulation. Regardless of which insulation you use, you may want to leave an access at the top of your walls, perhaps a 1x6 wood panel, that you can remove, check for settling, and add more insulation as needed. With cavities that are smaller you can probably rely on some combination of volume, friction, glue, or tape. We also have a great deal on no-itch foil-faced cotton duct wrap (and pipe wrap) which is an affordable option for insulating your van conversion floor! 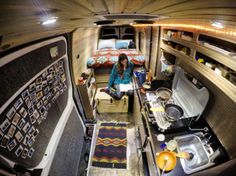 One of our Sprinter Van Conversion sheep wool insulation customers shared this article about their conversion experience. The folks at SEEK Dry Goods documented their Ford Transit Van Conversion here. Finally, if your are in the Pacific Northwest and want someone else to set you up with a completed van, checkout our collaborators at ActionVan, where they "strive to use eco-friendly, low VOC products, and materials whenever possible when building our vehicles. Waste is minimized and recycling is mandatory." Check back, as we will be adding to this page regularly!